Buy online 16 sq. ft. 4 ft. x 4 ft. x 3/8 in. Plastic Underlayment for Tile Insert on Deck Under Grill or Fire Pit TIK0810 and leave review or share with Your friends. Protect your outdoor deck while adding sophisticated tile accents with the TI-ProBoard 4 ft. x 4 ft. grill mat tile insert kit. Kit materials install easily to prepare the deck surface for setting materials and tile installation. TI-ProBoard is ideal for protecting wood or composite decks from stains and damage of a fire pit or outdoor cooking area. Kit includes 16 sq. 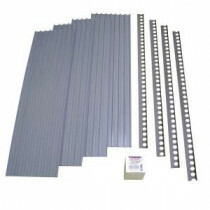 ft. of TI-ProBoard underlayment material, 16 ft. of edging and 50 fasteners. Enjoy stylish outdoor solid surfaces that are durable and easy to maintain.